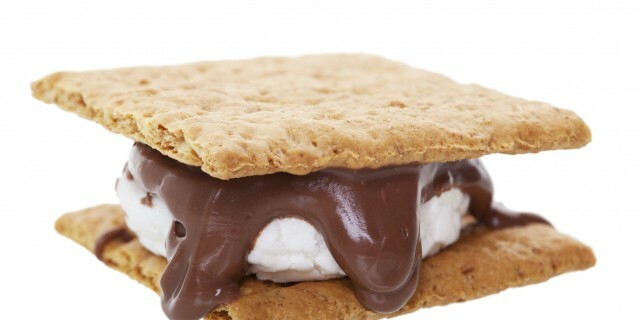 August 10th is National S’mores Day. What a delicious holiday! While the origins of this campsite classic are a mystery, the first published ‘recipe’ for s’mores (as if they needed one) is found in a 1927 handbook called Tramping and Trailing with the Girl Scouts. From that day on, campers hollered for “some more,” and s’mores became a requisite fireside dessert. Comprised of just 3 ingredients: graham crackers, chocolate and toasted marshmallow, s’mores make for an easy after-dinner delight. But for the adventurous at heart, I ask, “Why stop there?” This DIY dessert begs to be updated. So let’s put a twist on the tradition, and make Souped-Up S’mores! The Extras – added fun… see below! The Goo – Dark chocolate, peanut butter cups, white chocolate, caramel-filled chocolates, mint chocolate, Nutella, I could go on forever. One key: get the thinner chocolate bars – not the really thick ones, or your chocolate won’t melt. I’ve added one more category – the Extras! I encourage fruit — sliced strawberries or bananas (makes us think we’re being a bit healthy, right?!). Another favorite is nuts. Sliced almonds are awesome, also crushed peanuts and pistachios. Then there are the wildcard items: Colored sprinkles, cinnamon sugar, fresh mint leaves, cocoa nibs, crushed cookies, flavored gourmet salts (think salted caramel), granola, crushed candy bars, go crazy! The one thing to remember is that a s’more is not a s’more unless the marshmallow is warm and gooey. If it’s not, it’s not a s’more. It’s a dry, boring, something-that-would-end-up-being-named a… S’NotVeryInteresting. S’Ordinary. S’DontDoThatAgain. S’NoThankYou. So, just make sure your marshmallow meets some heat. You can make s’mores at a campfire, but it’s just as easy to do (carefully!) in a fireplace, backyard barbeque, oven broiler, or even over a candle at home. Corral your ingredients first, so that they’re ready when your marshmallow is. Put the marshmallow on a long stick or roasting fork, and hold over the heat until it’s hot and as brown as you like it. When it’s assembly time, make sure the glue and the goo ‘meet,’ so the hot marshmallow can work its magic melting the chocolate. Then stack on the other layers until you’ve made your masterpiece. - Sugar cookies with peanut butter cup, vanilla marshmallow and bananas. - Gingersnap cookie, sliced strawberries, dark chocolate, a dash of cinnamon sugar. - Chocolate cookies, vanilla marshmallow and fresh mint leaves. - Cinnamon grahams with chocolate gourmet marshmallow, white chocolate with mandarin oranges. For a grown-up variation on s’mores, the flavor-filled twist goes like this: Take your marshmallows, put them in a shallow airtight container, and cover them with liqueur – raspberry is a favorite, or you could use vanilla vodka, Kahlua, or Cointreau. Let them sit for at least 30 minutes, but not more than 3 hours (they’ll melt!). This technique works best with sturdy ordinary commercial marshmallows. Take them out of the container with your roasting fork, let the excess liqueur drip off a bit, and roast away. These “happy” marshmallows only need to be roasted for a few seconds, just enough to get them hot and sticky And be careful, they can flame up if you get too close to the fire!